I wish everyone a happy, healthy and prosperous New Year. Japan Water Forum has moved steadily and surely forward thanks to the help and support of our many members and stakeholders. On December 11th and 12th, the Third Asia-Pacific Water Summit took place in Myanmar. The opening ceremony began with a speech by State Counselor Aung San Suu Kyi. The water summit was co-organized by the government of the host country and the Asia-Pacific Water Forum, an international non-governmental network organization. Japan Water Forum, an NGO, served as secretariat. Top governmental leaders from the Asia-Pacific region participated. This summit, however, was not a government-level conference; it was organized by NGOs and NPOs. So why are top political leaders invited to the water summit? The answer is quite simple: to overcome vertically divided administrations. Water administration is complicated. I can say confidently that it is the most complicated of all administrative systems. 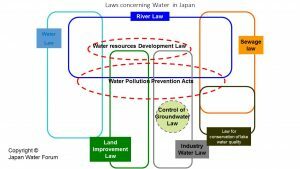 You can see this easily in figure 1, which shows water-related laws and the relevant ministries in Japan. Administrative activities are regulated through laws. In other words, no ministry or agency may address an issue without first obtaining legal grounds to act. However, laws cannot regulate all social activities. Therefore, gaps are left between the regulatory bodies that are meant to regulate social activities. In modern society, social activities are particularly complicated and encompass a wide range of issues. 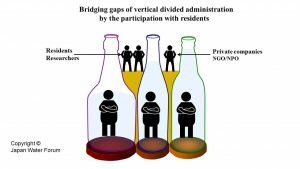 If there are gaps between administrative bodies, individuals risk falling into these gaps while pursuing their social activities. This problem is caused by vertically divided administrations. Figure 2 shows a vertically divided administration, depicting struggling individuals who have fallen into the gaps. The bottles symbolize the administration of each sector. The coasters under the bottles represent the laws controlled by each administration. Administrative execution is implemented vertically based on various laws. Laws symbolized by the coasters are tightly organized in order to provide a stable society. However, the neck of the bottle, representing the limits of the administration’s jurisdiction, becomes narrower towards the top, leaving a gap between it and other administrative bodies. If someone falls into the gap, no administrative office will help them because the gaps are outside their jurisdiction. 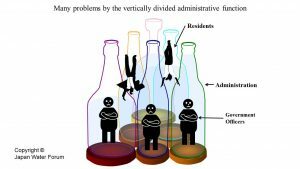 Administrators are not obliged to go outside their bottle to help those who have fallen into the gaps. They risk being held liable they cannot help the people. Therefore, administrative officers do nothing but stay put with crossed arms. In all areas of administration, there are problems caused by this vertically divided structure. A prime example of this is the water sector. The Third Asia-Pacific Water Summit included ten thematic sessions. One was entitled Improving Sanitation and Wastewater Management. It was co-organized by the Ministry of Land, Infrastructure, Transport and Tourism of Japan (MLIT), the Ministry of the Environment (MOE) of Japan, and the Japan Sanitation Consortium (JSC), a private organization. It was significant that the MLIT and the MOE co-organized this session. As far as I could recall, they had never co-hosted a session. I was interested in how they would work together. High-ranking officials from the Sewerage and Wastewater Management Department of MLIT and from the MOE participated in the session. I was surprised that officials from these ministries, that had previously been on bad terms with each other, were working together in Myanmar. They ran a session together, and took leadership roles at a meeting consisting of experts on sanitation from countries in the Asia-Pacific region. When I was an administrative official about twenty years ago, public health officials of the MLIT and MOE were in competition with each other. The Sewerage and Wastewater Management Department of MLIT and the Sewage Treatment Department of MOE were fighting over jurisdiction. Their greatest challenge was how to increase budgets for their own projects and how to get a larger portion than their rival of the limited national budget. I was delighted to see MLIT and the MOE cooperating at the summit. The Asia-Pacific Water Summit contributes not only to the healthy development of the region, but also to the evolution of Japanese administration. It is not too much to say that this is why I have been involved in NPO activities at Japan Water Forum. It is private companies and NGOs/NPOs that will fill the gaps depicted in figure 3. I saw a good example of this with my own eyes in Myanmar. One of our NPO activities provided a good opportunity to fill in the gaps caused by vertically divided administration. This may be a small step, but it has a great potential to affect not only the water sector but also many other sectors. We must not advocate private-public partnerships only rhetorically; we must make the concept become a reality. Thus we will embark on a new era of rebuilding Japanese society.